Pizza is a delicious food/snack given to us by the Italians. Pizza is basically hard bread with some toppings. Every Pizza must have cheese, if not it will not be Pizza. 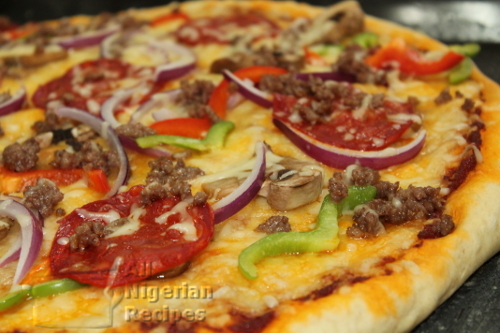 For those with Nigerian taste buds, Pizza may taste strange when you eat it for the first time. But with time, when you get used to the taste and texture, you will love it! The great thing about Pizza is that you can use any food item for the topping. You can even add ogiri to it if you fancy a bread/cheese/ogiri combo. The following quantities of ingredients make a thick pizza crust. If you want a thin pizza crust but still 12 inches diameter, use half the quantities of ingredients. These are my favourite Pizza toppings. All these ingredients can be purchased from supermarkets all over the world. If you are in Nigeria, look for them in big department stores like Shoprite. Like I mentioned earlier, feel free to use a combination of fruits, vegetables and meat that catches your fancy. Mozzarella cheese and tomato sauce are the only standard cheese toppings. Feel free to add more cheese if you wish. The minced meat should be fried in vegetable oil before adding it on the Pizza. Ensure that all the utensils and equipment you will use are clean and dry. Heat up some water. This is the warm water you will use to mix the Pizza dough. Sift the plain flour into a clean dry bowl. The bowl should be big enough for mixing the flour and other ingredients. Sifting airs the flour and breaks up any lumps making it easier to mix. Add the yeast to the dry flour and mix. This is important so the salt (added next) does not touch the yeast. Add the sugar and salt and mix very well. Then add the olive oil and mix very well. Start adding the warm water and mix with a spatula at the same time till all the water has been absorbed. Then continue by hand till a smooth soft dough is achieved. Fold the dough and place it in the bowl. Cover the bowl with a thin plastic film or a warm towel and place in a warm place for the dough to rise for 1 hour. I usually put this in the oven (turned OFF). Traditionally, Pizza is laid on a pizza stone and baked in a clay oven but unless you live in a beautiful Italian countryside, what most of us have is a standard kitchen oven. And you most probably do not have a pizza stone. So, we will place this Pizza in an oven tray and bake it in a standard kitchen oven. Rub some margarine in your oven tray, making sure that every part of the tray is covered with a thin layer of margarine. You can also use soft butter for this. Sprinkle some flour on it making sure the flour covers all the margarine. When done, pour out the excess flour. After 1 hour, bring out the Pizza dough from the warm place. You'll notice that the pizza dough is puffy. Knead it for a bit and transfer to the oven tray. Start spreading the dough in a circular motion like this till it's about 12 inches in diameter. The dough may resist as you do this but keep going till you can get the dough to spread as wide as possible. When done, cover the dough and place in a warm place to rise again for 45 minutes. While waiting for the Pizza dough to rise a second time, wash and slice the vegetables for the pizza topping. Fry the minced beef in a small amount of vegetable oil. It is OK when the beef turns pale. Prepare the tomato sauce for the pizza by adding stock cube, onion powder and salt to some Tomato Stew (fresh tomato puree fried in vegetable oil). You can also add other dry herbs you love. After 45 minutes, bring out the pizza dough from the warm place and you will notice that the dough has puffed up again. It is also easier to manipulate so spread it out more. Rub some olive oil on the dough. Put the pizza in a preheated oven (180°C or 360F) and bake for 20 to 25 minutes or till the pizza crust is light brown and the cheese is liquefied by the heat. Bring the pizza out from the oven and place the rest of the toppings on top. Put it back in the oven and bake for 2 minutes maximum, you do not want the vegetables to become dull.